Rob LeFebvre has been a freelance technology writer for 10 years. His articles have appeared in 148Apps, Cult of Mac, Engadget, and many others. Samsung has recently begun rolling out Android Pie to its Galaxy Note 8 and Note 9 devices, and it comes with a new user interface, dubbed Samsung One UI, which has the goal of helping you pay attention to the things that matter most. The redesigned interface is meant to help you focus on the important stuff without overwhelming you with data. The first thing you’ll notice is a decluttered screen. Samsung has made it so that you’ll see more of the information you want and less of the stuff you don’t. They’ve separated the screen into two main parts: the viewing area and the interaction area. Putting important info in the top viewing area will help you know instantly what you’re looking at, while the lower interaction area will help you do what you need to in an instant. With the rise of massive phones like the Note series, it can be tricky to reach interface elements at the top of the screen when using one hand. Samsung’s new One UI moves important buttons and tappable elements closer to the bottom of the screen so you can tap easily without straining. There’s a new Dark Mode that helps you focus only on the things important to you when you’re viewing your phone in a dim room. Samsung also simplifies the imagery you’ll see, like when your next alarm is scheduled for at the top of the screen. Looking at the Settings page, for example, Android Central notes that it’s been simplified with related settings grouped together. Email, notes, Phone and other Samsung apps have also been given a refresh to only show important information when you’re using them. Samsung has also updated its visuals for better clarity and contrast. That will help you see things more easily. Even better, many of the new One UI elements will be tweaked to match the specific hardware you’re using. If your phone has specific colors on its case, you’ll likely see those colors in the user interface more often. Check out that new photos screen - rounded rectangles show you a thumbnail of the stuff contained in specific albums. No more, no less. It will be easier to find what you want when searching for a specific picture or album. Ultimately, Samsung’s new One UI should help us all focus on our productivity more. Sure, design changes like this can take some iteration, but Samsung’s push to declutter and help us see what we need to is a good step forward. 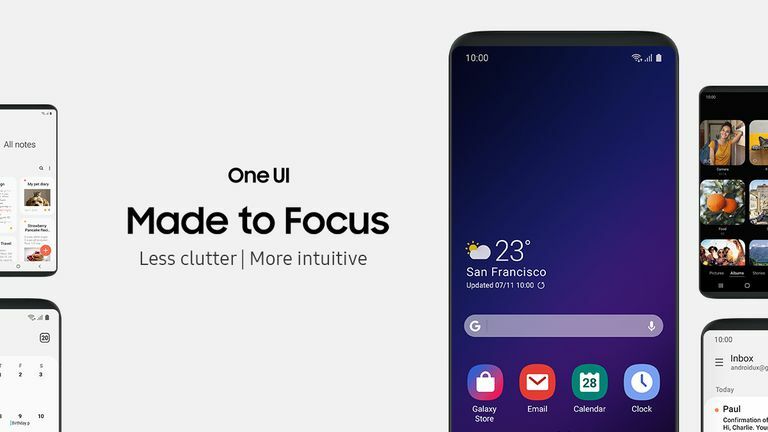 What Does Samsung's One UI Mobile Interface Look Like? Is Google Fit Just Another Fitness Tracker or is it Different From the Rest?